Where once video artists set about attempting to subvert broadcast television, recently they seem to have surrendered to its normative codes. Since the most troubling aspects of TV have tended to get worse over time, shouldn’t artists retain a questioning attitude towards it? This entry was posted in Art Monthly Monthly, Uncategorized and tagged activism, activist video, art ton TV, autonomy, Big Brother, broadcast television, Channel 4, colin perry, Isaac Julien, Marxist art, Michael Kustow, normative codes. TV's normative codes. 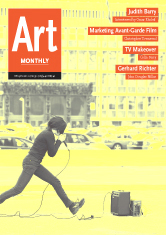 visual art, parasitism, Stuart Marshall, subvert, TV, TVTV, video art on December 20, 2011 by artmonthly.